It’s a chilly Sunday evening in Detroit like many during the winter months, lots of bundled up folks make their way into Jam Handy, a large warehouse-like building located off of the once prestigious Grand Boulevard, just north of the now bustling Midtown. As people rush inside for warmth, they generously donate five dollars and find a cozy spot inside. Each one of these curious individuals just entered a monthly event called, Detroit SOUP, a microfunding dinner that helps bolster community-based development with collaboration and support from within Detroit and beyond. The Awesome Mitten covered the event earlier on when it was first gathering steam, and now we’re revisiting the story after some years and personal involvement in its growth to highlight its upcoming five year anniversary party. 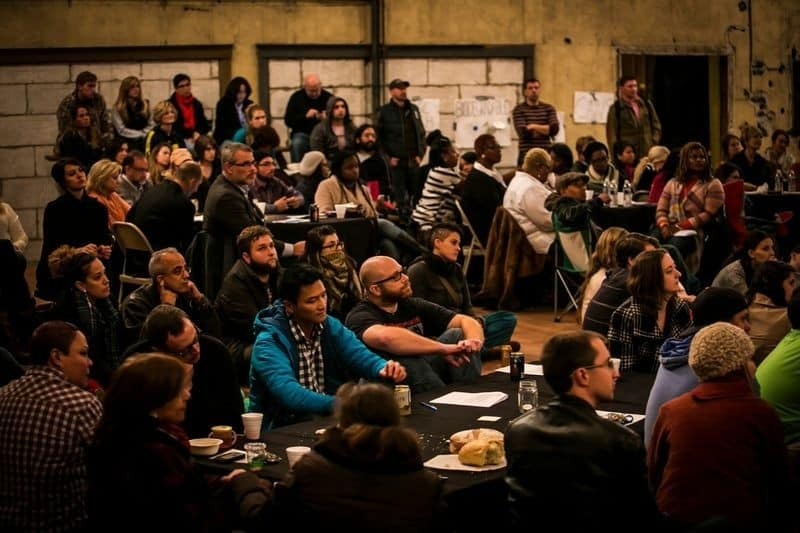 Detroit SOUP has been a staple over the past several years for community engagement that helps to connect people within the city and suburbs with similar ideas for what they see possible in the city. Magical things happen on these Sundays in the D; people have met their future life partners, obtained jobs, and even started their own businesses. All of this is very exciting, but a key figure in all of this success relies on one lovely lady, Amy Kaherl. Now, if you have not attended a Citywide SOUP event before, then you have missed out on the magnamious force that is the leader behind this important project. She is a brilliant Detroiter that oozes passion from every pore. Not only has she hosted one of the most integral events in Detroit community development for the past five years, helping individuals take their ideas to the next plateau, but she is one of the most caring humans on the globe (in my humble opinion). With a “resurgence” bubbling and brewing in the City of Detroit, it seems like everyone is looking at the city as a blank slate, seeing what the next move might be. Recovering from a huge deficit and a city plagued with crime, it’s going to be an interesting next couple of years. While many folks are noticing the changes happening Downtown, individuals like Kaherl who are truly making the city a better place are taking the time and the energy to value what is happening on every inch of Detroit. The organization supports nine other SOUPs that are specific to different regions in Detroit; Kaherl mentors her Board Leaders in those communities to listen to what the people need and help deliver it. She never takes no for an answer, and her bright smile, contagious laugh, and spirit illuminate any room. Not only does she hold Detroit SOUP, but Kaherl can also kick out the jams, throwing a monthly party at The Old Miami by the name of Nothing Elegant. Best friend, Sara Aldridge who runs Our/Detroit Vodka, hits the decks with her once a month to spin hot fire all night long. At any given Saturday night party, you might hear a wide range of music from 90’s hip-hop to funk and electro to 80’s hits from these two charismatic ladies. They keep the dance floor grooving all night long! Just like SOUP, Nothing Elegant parties are another fine example of the nuanced ways that Detroit inspires the community it molds through unique experiences and passionate individuals making them all possible. Now that you know just how important Kaherl’s influence has been on Detroit, let’s get into the nitty gritty. The five-year anniversary party will take place at Ford Field on Sunday, February 15th, with appearances from past SOUP winners, dinner, drinks, a performance from Shakespeare In Detroit, and much, much more. You can purchase your tickets for the event here, and don’t forget to bring a friend! 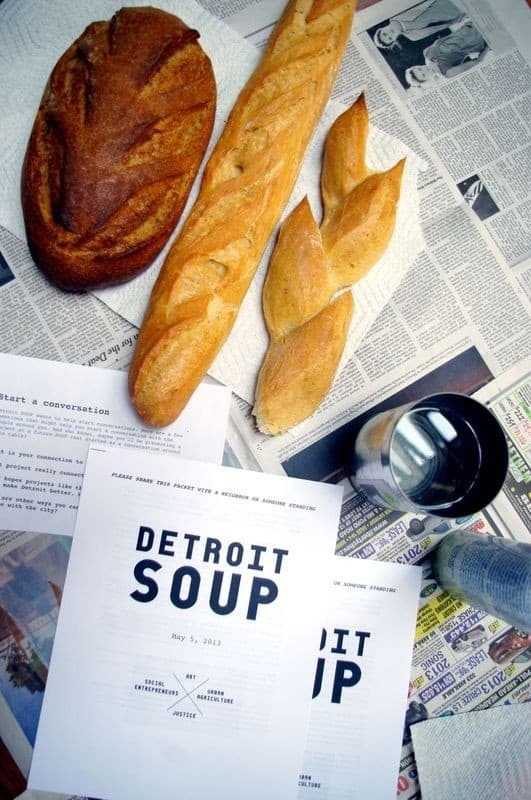 In order to keep the spirit of community alive in Detroit, events like Detroit SOUP need to keep growing and bolstering this fine city. Tagged Amy Kaherl, community development, Detroit, Detroit neighborhoods, detroit soup, downtown, ford field, Grand Boulevard, Jam Handy, Midtown, Nothing Elegant, Our/Detroit Vodka, Shakespeare in Detroit, The Old Miami.